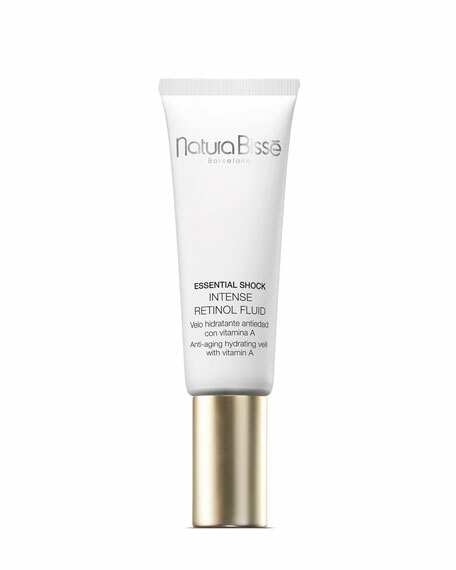 Natura Bisse Essential Shock Intense Retinol Fluid, 1.7 oz. Natura BisseEssential Shock Intense Retinol Fluid, 1.7 oz. An all-in-one product for a youthful complexion seeing signs of aging, combination skin and for men. Its formula, containing retinol (vitamin A), Hydro-24 Complex, a cocktail of amino acids (collagen, elastin...), soy proteins, mushroom extract and wheat germ extract, gives skin an extraordinary ability to maintain hydration and creates a light veil, like a second skin that doubles the moisturizing benefits of your regular cream. In addition, retinol deeply regenerates skin, visibly softening wrinkles while providing exceptional antioxidant action to effectively defeat premature aging. Apply every day and/or night to face, neck, and décolleté. Gently massage until completely absorbed. It can also be used as an ultra-hydrating treatment for the eye contour area. Apply on the eye contour area with a gentle massage until absorbed. This product contains retinol (vitamin A) that may increase your skin's sensitivity to the sun. Use high sunscreen daily. Not recommended for use within 72 hours of waxing or exfoliation. Omorovicza Rejuvenating Night Cream, 1.7 oz.